Blackbaud has just released its preliminary research and findings on 2008 Online Giving Trends. I am considering this report alongside Steve McLaughlin’s earlier blog post, which contemplates the number of website clicks it takes for someone to donate to your organization. How can we use social media to take advantage of these two trends ? A multi-channel strategy (such as web, email, direct appeal, events, etc.) is the successful approach to building an online fundraising winning strategy. 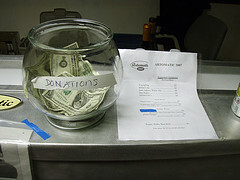 To support this, Blackbaud reports that “organizations using the Internet mostly for donor acquisition and without integrated strategies usually see higher attrition rates than other nonprofits.” With social media, there are many different methods available to solicit and remind lapsed donors, as well as direct them to all your other fundraising channels! McLaughlin also ponders the number of clicks it takes for someone to donate to your organization. It is anywhere from one to ten. Chris Garrett, interviewed here, says that “we all know it takes multiple “touches” of a prospect before they will open their wallet, on occasions up to seven times.” He refers to keeping customers on a site as increasing the “stickiness” of the website. Obviously refreshed content on a blog brings customers/donors back for new information, but how to make websites less static? Why not cross-reference social media to your website? Link your site with each blog post; refresh the home page material with the newest blog post. Create a Twitter stream that periodically mentions something new on the website. Obvious but not done: post comments from users/connections/friends about the organization on your home page. This encourages people to check out your other social media homes but also keep them coming back to see the recent feedback. Maybe it’s them! Send donors a member-created vlog highlighting a great project of the organization. Try to create viral buzz or tagging. Follow up with phone solicitations. Recognize important contributors on the blog or in a community forum. Create a Facebook or MySpace challenge to bring people to your offline fundraiser. Tweet from the offline fundraiser itself! Create a fun, interactive challenge asking each supporter to bring one friend to your Twitter stream, blog, website or online group. This will increase your donor pool. Donations via the Facebook or Myspace causes application. I’d love to hear of how organizations have cross-fertilized fundraising channels with social media. I’m looking for research on using social media to create traffic for the website or increase the number of times an individual will return. Thoughts? Food for another blog post! Thanks for posting the link to the article of Blackbaud as well as your suggestions to ‘increase the “stickiness” of a website. I’m currently working for a new, innovative organization called Play it Forward. Launching in Febuary 2009 we aim to grow into a global social network that brings together people and development projects to make a positive change worldwide. In order to achieve this we use new media and social media. The website features an interactive globe that people can browse for development projects that appeal to them. Once a project has been found people can donate or support the project in other ways. In return they get full insight into the project’s details while they will be kept updated through video messages made by the project’s fieldworkers. Supporters (‘Players’) get their own profile page that they can use to interact with fellow Players, friends, fieldworkers etc. Think of the gameplay of the Sims, the usability of Google Earth and the social impact of Facebook combined! For more ideas on the concept check out http://www.playitforward.nl and don’t hesitate to ask me any questions/send me feedback on the plan so far.